This article will teach you how to automatically conform your address records which will get rid of discrepancies between things like St., and Street. It also goes through the steps to set your conform method in your Committee/Organization record (if it hasn’t been set already). Tip: Learn a lot about address management for your database by reading this article. After running address cleanups it’s a good idea to cleanup duplicate contact records, here’s how. 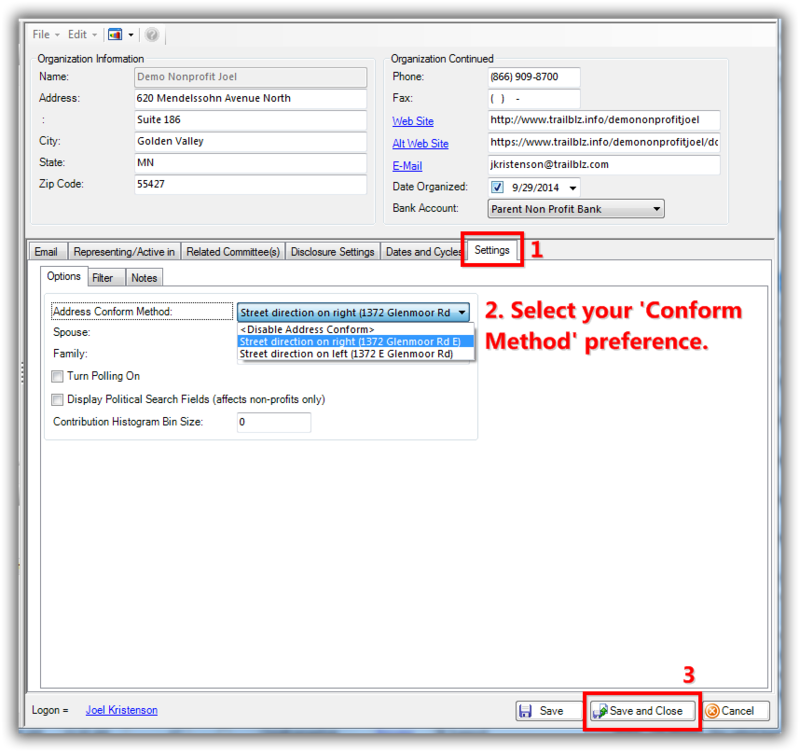 Important: it’s required that you set the ‘conform method’ prior to running the mass address conform operation on your database and this requires administrative access to the database. 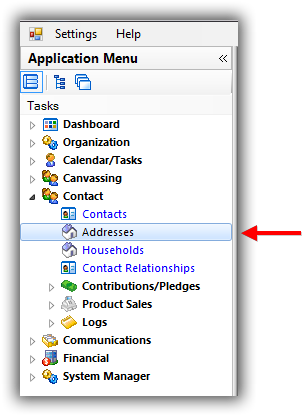 Navigate to your Organization record (if nonprofit) or the Committee record (if political) by following Application Menu > System Manger > Lists > Organization/Committee. 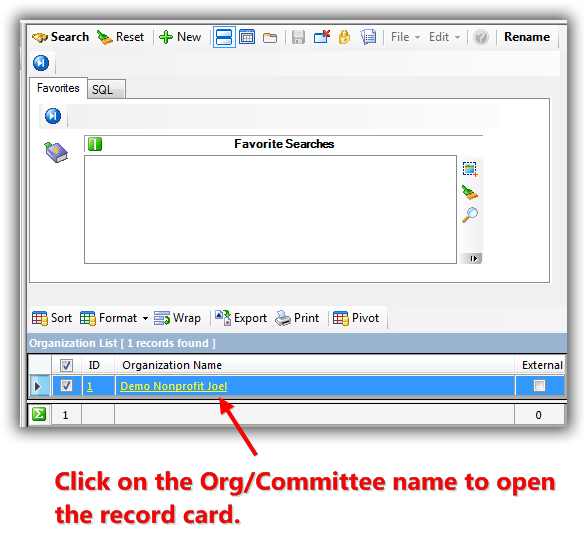 Click on the name to open your Org/Committee record card. In this example it was called “Demo Nonprofit Joel”. Navigate to the Settings tab, select your ‘Conform Method’ preference, and [Save and Close]. In my example I selected the option ‘Street direction on right (1372 Glenmoor Rd E’. 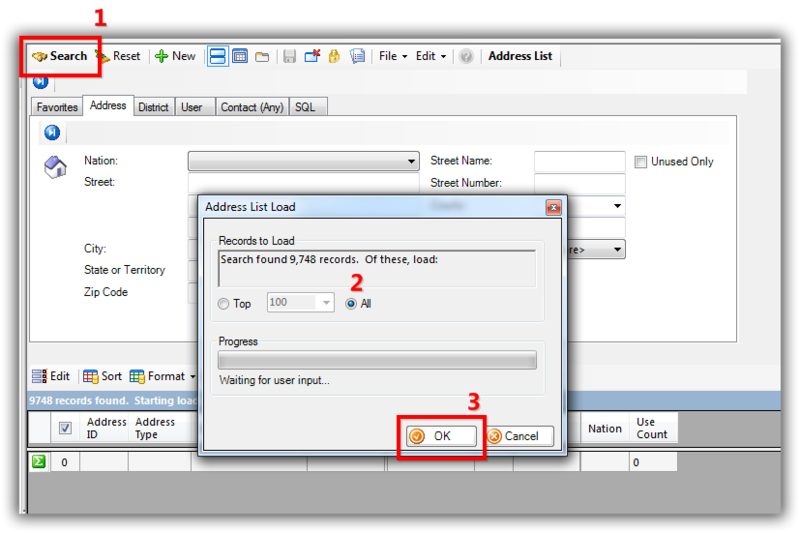 Note: you can conform all address records, or a segment of your database. In this example I updated all records. Navigate to the Addresses list under the Application Menu. Click [Search] and load all records. 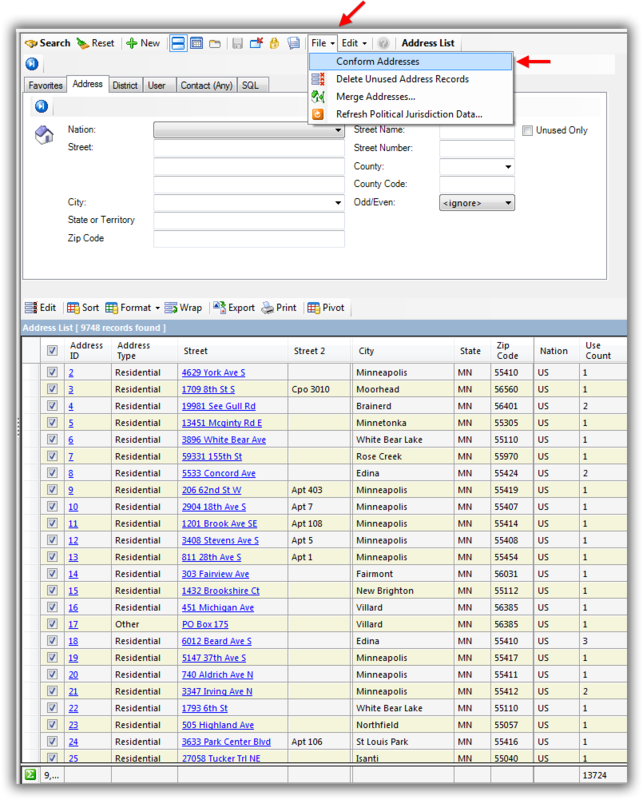 In this example I had 9,748 address records. Select File > Conform Addresses. Click [OK] when prompted (if you are 100% sure you want to run this mass update operation). 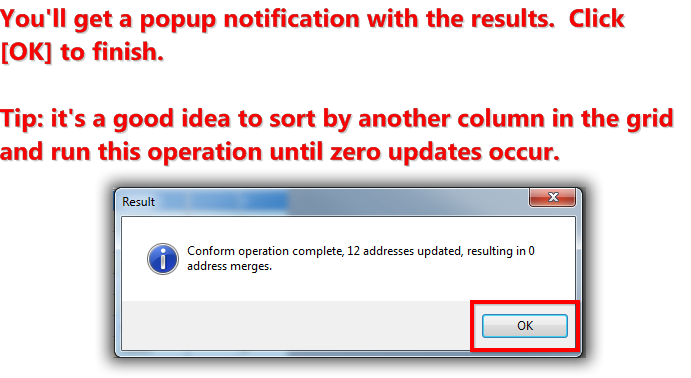 Once the process is finished you’ll get a popup notification with the results, click [OK] to finish. Tip: you should sort the list by another column (i.e. City or Zip Code) and re-run the process until the results are zero. Take a look at the related resources below for a variety of other articles and videos on this topic. Article: Why won’t some of my records merge? Video: Households – What To Do B4 Householding!! * As a policy we require that you have taken our intro training class before calling or emailing our live support team. Click here to view our calendar for upcoming classes and events. Feel free to sign up other members on your team for the same training. * After registering you’ll receive a confirmation email with the instructions for how to log into the GoToMeeting session where we host our live interactive trainings. * This service is included in your contract.